Ron Robertson-Swann’s sculpture, “Vault” (aka the Yellow Peril) was only in the Melbourne City Square for a year but it haunts Melbourne like Banquo’s ghost at the banquet. The sculpture certainly haunts the architects DCM who choose it. It was only in the City Square for a year but it left a permanent psychic mark on Melbourne. The sculpture has been the subject of endless discussion when it was completed and Wallis wonders why Melbourne became so obsessed with this sculpture. Wasn’t there anything more important to talk about in Melbourne? Vault has no meaning besides being art; it is simply an arrangement of yellow steel planes. The significance of it to Melbourne is the subject of the book. The cast of characters spans Melbourne and clearly describes the conflict’s political dimensions. Wallis does note that the conflict was as much aged-based as it was one between the left and right. It was Cr Osborne who popularised its derogatory nickname – “the yellow peril”. As well as, covering the controversy, Wallis comprehensively examination of the whole process from the competition for the commission, the commission and construction, the Melbourne City Council politics and the public reaction, the dismantling, removal and exile to Batman Park. It is interesting to note that BHP contributed to the cost of the steel for Vault. That with a larger budget for the sculpture the City Square might have had a Henry Moore or Hans Arp sculpture. And that if the budget had been smaller friends of Montsalvat sculptor Matcham Skipper might have been able to pay for a place for him in the City Square. Wallis looks closely at the reactions of the public to the sculpture, not in just the newspaper’s letters to the editor page. He looks at people climbing it, graffiti, homeless sleeping under it. The way that people moved around the sculpture was part of the commission and part of the concern of its critics. The controversy over “Vault” extended the conservative position on Melbourne’s public sculpture. Long after their experience with “Vault” Melbourne City Council shunned any public sculpture commissions, paralyzed by fear of another controversy. The little good that came out of the whole incident was that it started the push that eventually the federal government introduced legislation protecting the moral rights of artists. The book is well written and attractively laid out – I like the side texts that expanded the history through sidetracks. The book also features lots of great photographs, cartoon clippings from newspapers and other evidence of sculpture’s significance in Melbourne. And there is sort of a happy ending to look forward to as the sculptor and the people of Melbourne finally accept “Vault” in its new location outside of the ACAG. 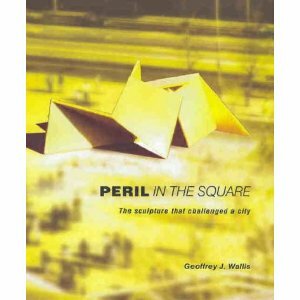 This entry was posted on Monday, January 23rd, 2012 at 11:34 AM	and tagged with Melbourne, Melbourne City Council, Melbourne City Square, Ron Robertson-Swann, Vault, Yellow Peril and posted in Art History, Book Reviews, Public Sculpture. You can follow any responses to this entry through the RSS 2.0 feed. It is a good read. I got my copy on a 6 week interlibrary loan from Bayside Libraries through Moreland Library – it cost me $3. It is $80 + new on Ebay. One hilarious aspect of this is that Ron, who is a dyed in the wool Greenbergian formalist, unwittingly produced a magnificent work of relational aesthetics or perhaps a situationist work. He would be horrified to be seen that way but the incredible exposure of social and cultural idiocies provoked by the work is pretty unparalleled and completely overshadows the physical work itself, notwithstanding the fact that it is probably the best example of formalist sculpture ever produced in Australia. Given that provocative social interaction is now a more highly regarded medium than welding steel, art history may well play the final cruellest joke of all on him by remembering him as an unwilling player in a broader form of conceptual art, a style he loathes as much as many loathed the yellow peril. Great irony, Ian. It is points out fundamental problem with Greenbergian formalism that you cannot create an object that is independent and outside of politics (in the broadest sense) or social discourse. Of course, there were Cold War political reasons for Greenberg pushing a pure formalism.